Warning Signs: Obama, a War President? Wouldn’t it be ironic if President Obama—who has shown that his every instinct is to pull back from any war or military conflict—ends up being a “war President” thanks to Kim Jung Un, the demented little dictator of North Korea? After World War II the Korean peninsula was divided between the Russians and the Americans with the 38th parallel as the line of demarcation known then and now as the Korean Demilitarized Zone (DMZ). It is 2.5 miles wide and the war has never been declared over. The Russians and Chinese backed the then-dictator, Kim Jung Un’s grandfather. When he died, his father took over. The young dictator, age 29, has inherited their belligerent attitude, but he’s the first to actually bring North Korea to the brink of a full-out war. When you tell diplomats to get out while they can, you are probably not bluffing. Thatis a scary thought considering the actors. 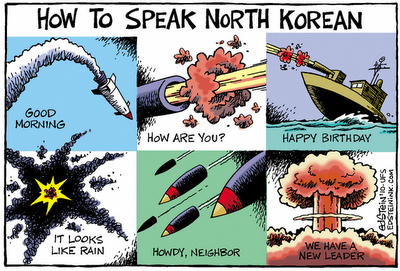 Seems to me North Korea makes a big noise every spring simply to extort money from the wealthy nations of the world. True. Every time the US and S. Korea hold joint military exercises, they complain. They then seek to extort something from the US and, in the past, they've gotten it. As I mentioned in the article, I suspect our troops are there to keep the S. Koreans from attacking the North to end the problem it poses for them. Obama will do everything in his power to avoid a war - even if it means paying the NK dictator to go away. If it were me I'd tell the NK's to bring it on. If ONE missile is fired then it would be seen as the start of war. 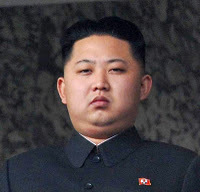 This little punk Kim Jung Un needs to get the beating he clearly didn't get when he was growing up. Enough with his childish tantrums. If he wants to play with the big boys then nows the time. Better to take care of N. Korea now rather than later as they are going to build a nuclear arsenal. If we wait we will regret it. Time to take that country out.